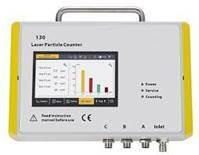 Series 130 is a new generation of laser particle counters optimized for applications in compressed air or compressed gases. With quality in mind and with the knowledge of costumers needs this instrument is designed for continuous operation 24 hours, 7 days a week. Depending on the selected model there is sensitivity available from 0.1 µm up to 5.0 µm. S 130 can fulfill the requirements stipulated in the compressed air standard ISO 8573-4. The measurement values represent the particle counts per ft3, l, m3 or alternatively in µg/m3. Settings can be done through the integrated display, our external display or through the service software.